Some organisms respond to a stimulus by automatically moving directly toward or away from or at some defined angle to it. These responses are called taxes. They are similar to tropisms in plants except that actual locomotion of the entire organism is involved. When a capillary tube filled with glucose is placed in a medium containing E. coli, the bacteria alter their locomotion so that they congregate near the opening of the tube. This chemotactic response does not depend on the bacteria being able to metabolize the substance although presumably that is the value under normal conditions. E. coli responds strongly to a number of organic molecules besides glucose, including galactose and the amino acids serine and aspartic acid. 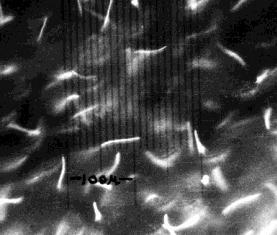 The photo (courtesy of Dr. Julius Adler from Science, 26 December 1969) shows how the bacteria have congregated at the opening of a capillary tube filled with a weak solution of an amino acid. Some of the motile cells of the immune system also display chemotaxis. The substances that attract them are called chemokines (for chemotactic cytokines). This scanning electron micrograph (courtesy of Drs. 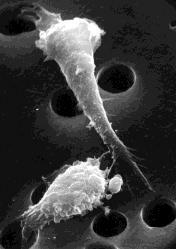 Ralph Snyderman and C. A. Daniels) shows two human monocytes migrating through the pores of a filter in response to a chemokine diffusing up from beneath. Photosynthetic microorganisms often display phototaxis. These photographs (courtesy of Dr. Mary Ella Feinleib of Tufts University) shows phototaxis in the unicellular green alga Chlamydomonas. Left: randomly oriented tracks formed during 1/3 sec by the algae swimming about in red light to which the are insensitive. Right: Upon adding a beam of blue-green light from one side, the tracks become oriented in its direction. This is a positive phototaxis. However, as the intensity of the light is increased, a point is reached where they abruptly reverse direction and swim away from the light (a negative phototaxis). The light receptor appears to be a 7-pass transmembrane protein named Channelopsin-1. Like rhodopsin, it is conjugated to retinal. Channelopsin-1 is a light-gated ion channel that opens to allow protons (H+) to pass through when light falls on it. The absorption spectrum of Channelopsin-1 peaks at 500 nm (blue-green), the same as the action spectrum of phototaxis in Chlamydomonas. 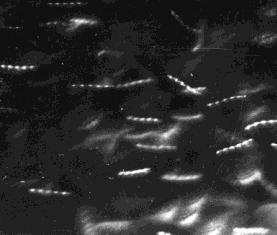 Several species of bacteria swim in the direction of magnetic lines of force. 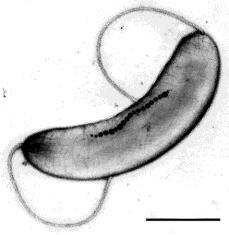 The electron micrograph (courtesy of R. B. Blakemore and N. Blakemore) is of the bacterium Magnetospirillum magnetotacticum (the bar represents 1 µm.). 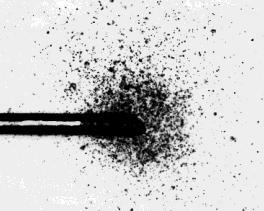 The row of dark objects within the cell are particle of magnetite (FeO.Fe2O3). These act like a compass needle, and in this species, which was found in a freshwater pond in New Hampshire (USA), orient their owner toward the North Pole. Because of the inclination of the earth's magnetic lines of force, this behavior causes the bacterium to swim downward and thus to return to the sediments in which it lives. For an organism as tiny as a bacterium, gravity is of no consequence. So here is an alternate mechanism by which dislodged bacteria can find their way back into their normal habitat. Magnetotactic bacteria in the Southern Hemisphere achieve the same result by swimming toward the South Pole. Particles resembling these magnetite particles have been found in the Martian meteorite ALH84001. If they were not formed by a purely chemical process (as some believe), they would be another entry in the hunt for evidence that Mars can (or could) support life [More].